L’Atelier de Joël Robuchon is the closest thing to a fine dining chain with almost identically appointed branches in numerous cities around the globe including Las Vegas and London. The bar-style seating can be brutally uncomfortable though which makes La Cuisine de Joël Robuchon a much more appealing alternative. Situated on the first floor above the London branch of L’Atelier, La Cuisine has much more comfortable and more conventional seating in a compact dining room decorated to look like someone’s kitchen. The decor and atmosphere may be warm, casual and inviting, but the food is unapologetically Modern European with attentive, knowledgeable service to match. The amuse bouche of foie gras topped with a parmesan foam isn’t as complex or as memorable as the much larger and somewhat similar starter sometimes available at Gauthier Soho, but it’s still a tasty way to start a meal. 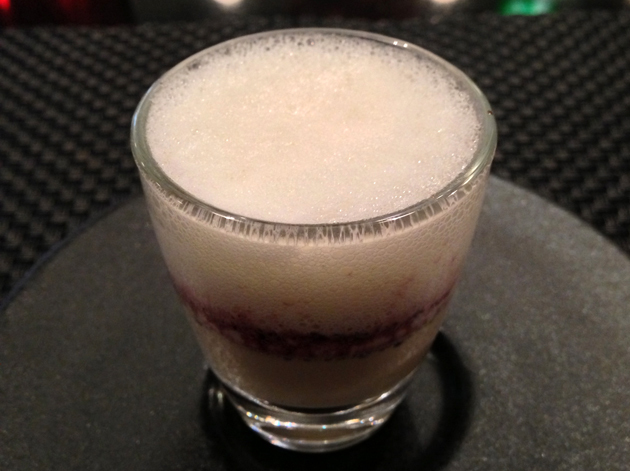 The rich and creamy flavours of the foie gras base and the parmesan foam complimented each other very well. The light wispiness of the foam may seem silly, but without it the dish wouldn’t have worked as well – the relatively heavy, viscous texture of parmesan in its usual form would have been too overwhelming. The first foie gras of the meal. The starter of caviar served on a bed of crab meat and lobster jelly may sound very rich, but it was a surprisingly insubstantial appetiser. 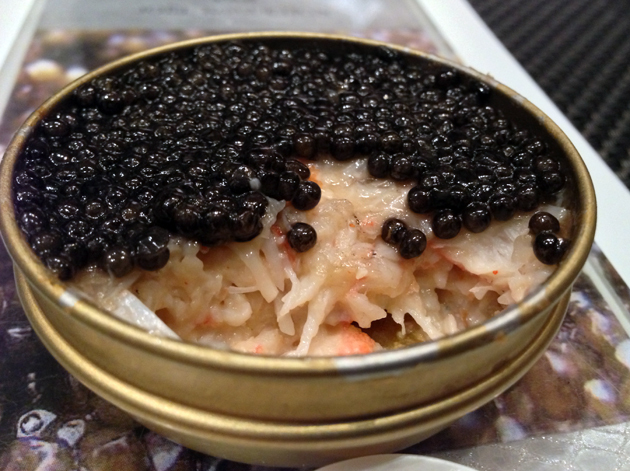 The moist crab head meat was a refreshing counterpoint to the slightly oily, slightly salty caviar but the sliver of lobster claw meat in jelly was too small to leave much of an impression. 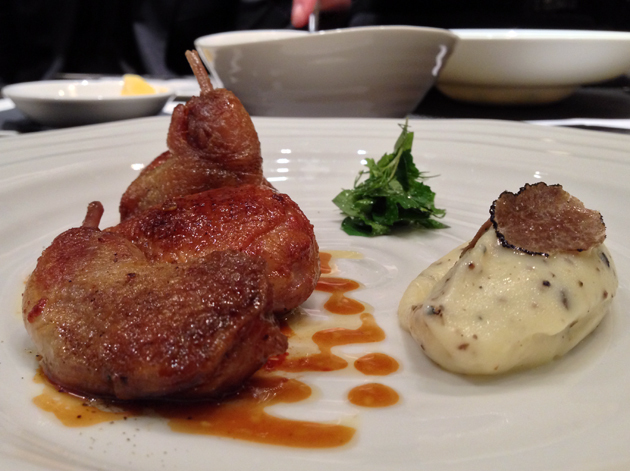 Foie gras popped up again in my main course, where it was stuffed inside quail and served alongside truffled mashed potatoes. The poultry was firm and hearty, but the very small amount of moderately rich foie gras was barely noticeable. The best thing about this dish was the rich, earthy and creamy mash. The dessert was all about chocolate. 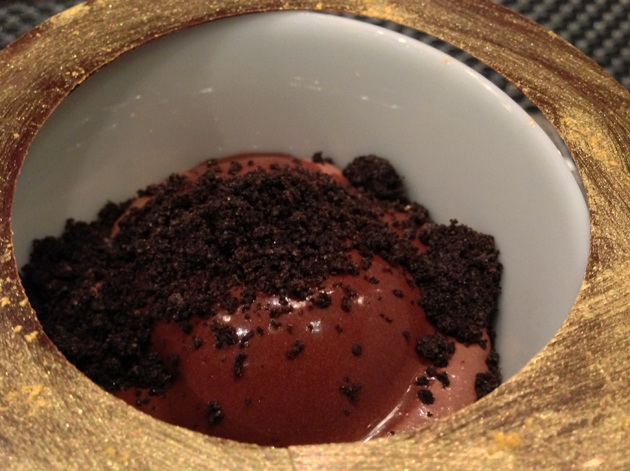 Served in an unusual gold gilded bowl, dark Madagascan chocolate was joined by a chocolate sorbet and ‘Oreo’ cookie crumb. The chocolate was smooth and very creamy but wasn’t as bittersweet as I expected. The bitterness came instead from the sorbet which wasn’t too icy and complimented the creaminess of the chocolate well while the ‘Oreo’ crumb had a subtle maltiness that was still nonetheless distinct and complimented the other elements nicely. I had very mixed feelings about my first meal at La Cuisine, so I had to go back for seconds. 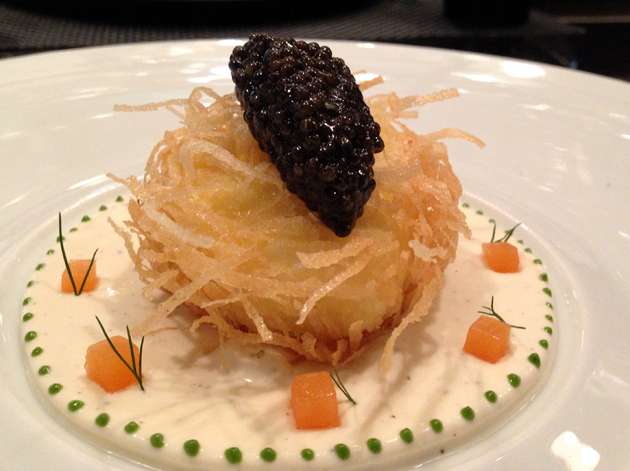 The amuse bouche was the same as before, but although I opted for a different starter, it still contained caviar. This time it was paired with a poached egg covered in a crisp rice shell and served with a salmon cream. The crispness of the rice shell contrasted nicely with the gooey runniness of the egg, while the salty caviar and the distinctly flavoured salmon cream added extra layers of richness. All of this made for a very satisfying start. Black cod is often found with miso in Japanese restaurants, but here the tender and light fish was served in a mildly zesty, citrusy sauce that brought out the black cod’s natural fatty moreishness very well. Although this deceptively simple dish isn’t heavy, the handy hemispheres of crisp daikon radish were still a welcome palate cleanser. I finished off my meal with the funky Le Bubble. 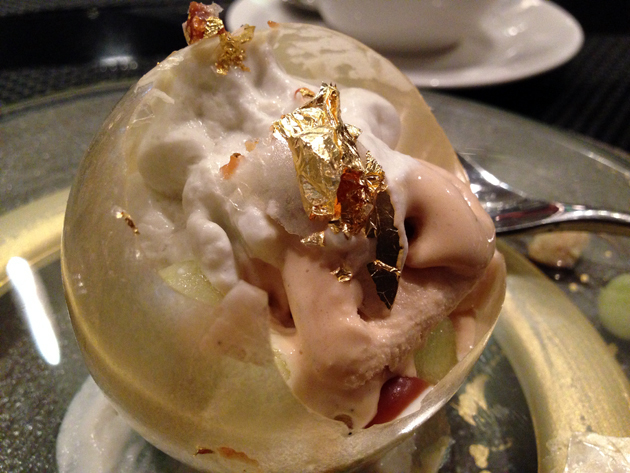 A bauble-like sugar sphere topped with gold leaf broke apart to reveal a coffee-flavoured cream, salted caramel and lemon-marinated apple pieces in the middle. The crisp sugar shell can be discarded (it has a nasty habit of sticking to your upper gums if you try eating it), which is just as well as its sugary sweetness can overwhelm the muted flavours of this dessert which are too subtle for their own good. The textures are just right though – the wispiness of the coffee cream contrasts nicely with the crispness of the apple pieces. It’s just a shame the coffee cream and the fruit aren’t more boldly flavoured and the occasional bursts of salty caramel are few and far between. 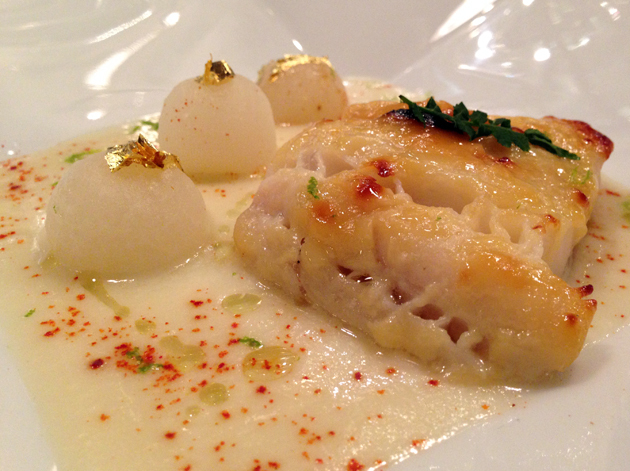 The quality of the food at La Cuisine de Joël Robuchon was erratic. At its best it can be very good indeed, but all too often it was merely average. I suspect this is due to the size of the menu which is large, sprawling and unfocussed by the standards of most other Modern European restaurants. All in all, this just isn’t good enough, not only because of the high prices, but also when accomplished competition such as Gauthier is a mere stone’s throw away. Must try harder. Total cost for one person including soft drinks and coffee: £75-100 approx. 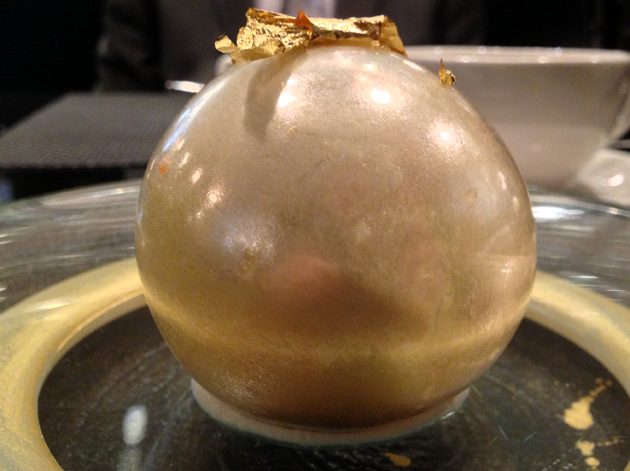 Tags: chocolate, foie gras, l'atelier de joel robuchon, la cuisine de joel robuchon, london, parmesan, quail, restaurant, review, sorbet. Bookmark the permalink.